ABERDEEN, Wash. – February 17, 2017 – Today, the design team behind the proposed Grays Harbor Gateway Center project released the summary of results from its final design survey. The survey results include feedback from participants who attended the final design community meeting at the Rotary Log Pavilion on January 19 along with more than 900 online survey participants. While this was not a scientific survey, the results are being used in concert with feedback from some of the primary tenants of the proposed Gateway Center in addition to information gathered during the initial feasibility study. The survey response demonstrated a preference for Option One – with 55 percent of respondents indicating it as their favorite design option. In contrast, 45 percent selected Option Two as their favorite design. In total, nearly 2,000 people representing 19 distinct communities on the Harbor have either attended a design meeting, participated in one or more surveys or shared their comments directly to the design team. This most recent survey was the third in a series of design surveys that followed community design charrette meetings between November 2016 and January 2017. The role of these surveys was to provide the greatest opportunity for community participation for those who were unable to attend the in-person community meetings. The design team not only looked to gain insight from the survey into the final two design concepts, but also gain perspectives about general design values and implications of any cost differences between the two concepts. In addition, the survey results showed a preference for the Option One design, the survey results also showed that cost was not a significant factor in determining design preference and that the most important qualities of the building remained sustainability, construction quality and landmark quality. Early community input from initial design meetings and surveys also indicated a desire to see the design reflect an appreciation for local history with a focus on the future. The historic inspiration for the design of Option One was the intricate lumberyard structures used to store and dry fresh cut timber. 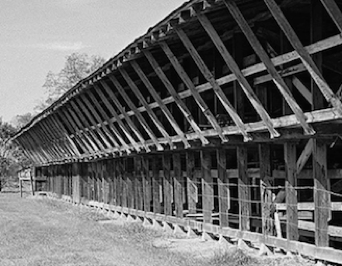 These structures would protect the timber from the elements while allowing air to circulate around the cut boards. The design team is now also exploring how it will be able to incorporate locally sourced Cross Laminated Timber (CLT) – into the design. This is an opportunity to not only demonstrate sustainability and construction quality, but also call out a specific component of the landmark quality of the building – a direct connection between the region’s past and its commitment to innovating for the future. 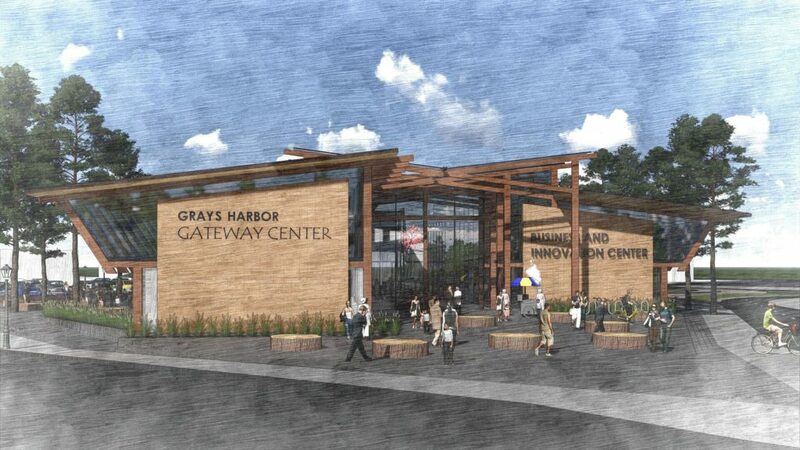 A full summary of the design survey results can be found on the Grays Harbor Gateway Center website [INSERT LINK]. The next step will be to share these results with the City Council at the February 22 meeting and begin the third phase of funding, leasing and planning for construction. Those close to the project will continue to meet with the community in the coming months to provide updates on progress and answer any questions about the process.